Bay Area Real Estate Bubble Blog - Most excellent blog. It is a shame that this blog was not added to my blogroll earlier as Doug has been blogging since January 2006. Bubble Pics -"housingbubblepicturesharing." View and upload the most bubblicious images. Please note this site is just getting started. Blog Rules: In order to create a more perfect blog, these are the rules that will be followed. Additional rules may be added as necessary. 7) If there are any questions regarding blog rules please email me at bubblemeter@gmail.com. The Chicago area housing market is quite fascinating. According to the OFHEO 1Q 2006 Report the 5 year price appreciation for homes in the Chicago area was 51% and the one year rate stood at 10.5%. Chicago's price appreciation rate is strong but not stratospheric like many metro areas in California or Florida. Like many other parts of the country job and wage growth over the past five years has been anemic (weak). The Chicago area economy has been stronger in then other large Midwestern cities like Cleveland or Detroit. In the Chicagoland area, as some call it, the price appreciation rate is quite varied depending on the neighborhood and type of property. Chicago-area sales of existing homes and condos fell 14.5 percent in July compared to the same month last year, but median prices rose 2.6 percent, according to the Illinois Association of Realtors. Nevertheless, single-family home sales in the Chicago area fell by 18.6 percent in July compared to last year at this time. Recent condo conversion, Barry Place in the Lakeview neighborhood. So what will happen with housing prices during the coming years? Overall I do not think the Chicago metro area is a bubble market. The typical housing unit is unlikely to decline in price by 20% in real dollars during from its peak price within 3 years of peak price. However, condos especially in the city itself are likely to fall by over 20% in real dollars. Certain 'hot' neighborhoods that have experienced very strong price appreciation may fall more then 20% in real dollars over the course of 3 years. Chicago, is certainly not bubblicious like San Diego, nevertheless declining real dollar prices will be a reality for the Chicago metro area in the coming years. 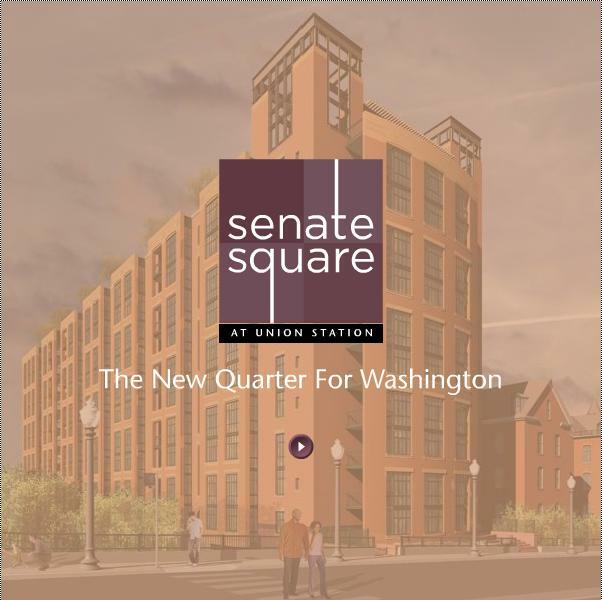 View from Congress Street in Washington, DC of Senate Square condo development. How about those construction cranes building condos in the Miami area? A friend who is involved in coordinating housing redevelopment projects in gentrifying parts of Brooklyn was busy blaming Bernanke for raising rates so high. He said work is slowing. I pointed out to him that historically, short tem interest rates are still on the low end. A recent college graduate wants to buy a newly built 1br condo to live in an inner suburb of Washington, DC. He was thinking of buying one for about 280K. He was pleased that the price had come a bit from last summer's peak. I asked him "How long do you plan to live there?" Me: "10 years? Don't you want a family and children and all well before then? In 10 years you'll be 35." 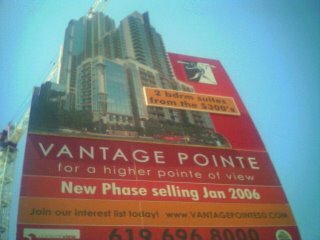 He: "Ok maybe 5 years"
Me: "What do you think the 280K condo you are considering buying will be worth in 5 years?" Yikes! Talk about unrealistic expectations. I politely explained why that would not happen. 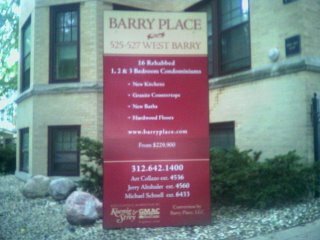 My mom's friend who is involved in specialty homebuilding in the North Shore area (northern Chicago suburbs along the lakefront) has been in the business for a few years. He told my mom that "nothing is selling." The mainstreaming of the housing bubble view is happening quickly. The significant declines happening in many markets across the US is quickly reaching Joe American. During this past week, there were a huge number of reports and stories across the mainstream media (msm). At The Housing Bubble Blog there is a great post where people Post Local Housing Market Observations Here. 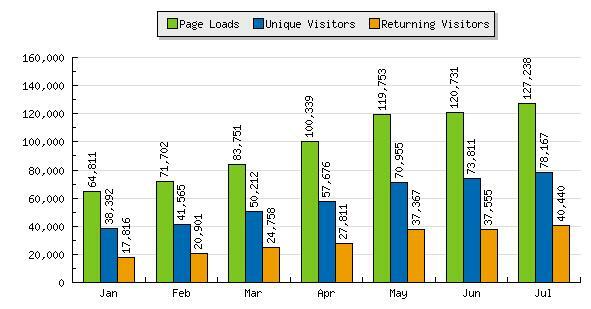 One commentator writes of the, " 'Zillow-gap' in Loudoun Co. Â getting larger every month! Homes are being listed for 5-20% below the zillow value!" FYI: Loudoun county is an outer suburb of Washington, DC. Southern California Real Estate Blog tell us why The Fed Cant Save Housing, even if it wanted to! He turns to history for evidence "Fed Funds rates dropped from 9 3/4 in Feb 89 to 3% in September 92, and California still had one of the worst housing-busts in recorded history in the US. A total drop of 6 3/4%! We currently stand at 5.25%. Not possible to even drop that much this time" Right on! The National Association of Realtors just released some of David Lereah's 'Greatest' Hits. These are some of the most requested power point presentations by NAR Chief Economist David Lereah and others from the last 12 months. It is was quite a story. 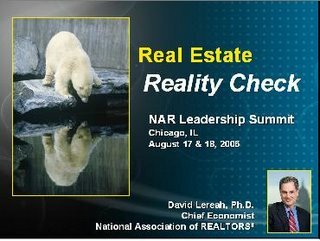 In a power point presentation from August's Realtors' Leadership conference in Chicago titled 'Reality Check' (ppt) David Lereah basically has many slides showing how housing prices have become divorced from reality. In David Lereah's presentation he writes "Soft Landing," "Price expected to fall for remainder of year," "Price fall to be limited due to pent-up demand at lower prices," "home prices begin to soften," and that a "correction is necessary." The Commerce Department released its July 2006 new home sales report. "Sales of new one-family houses in July 2006 were at a seasonally adjusted annual rate of 1,072,000, according to estimates released jointly today by the U.S. Census Bureau and the Department of Housing and Urban Development. This is 4.3 percent (±11.5%)* below the revised June rate of 1,120,000 and is 21.6 percent (±10.1%) below the July 2005 estimate of 1,367,000." The figure was weaker than the average Wall Street estimate of a pace of 1.105 million units. The level of new home sales was down 21.6% from the pace a year earlier, when many analysts had warned about a property market bubble. More bad news for the 'soft landing' cheerleaders. The 'soft landing' theory is being put to rest. Soon the argument will merely be how hard will the landing be. OFHEO Delays Report: What is Up? The Office of Federal Housing Enterprise Oversight (OFHEO) is delaying the realease (pdf) of it's 2Q Housing Price Index (HPI) report from September 1st to September 5th. No reason was given. What's up with that? 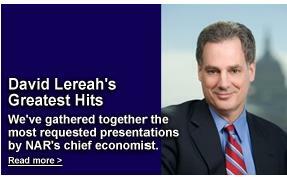 The National Association of Realtors just released some of David Lereah's 'Greatest' Hits. These are some of the most requested power point presentations by NAR Chief Economist David Lereah and others from the last 12 months. 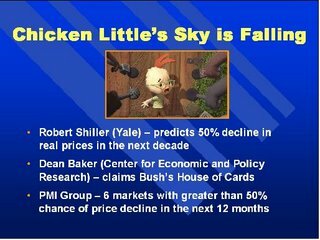 In October 2005, David Lereah chief economist of the National Association of Realtors, was busy calling the bubble believers 'chicken littles.' Many of the predictions espoused by the 'chicken littles' are fast becoming closer to reality. Inversely, David Lereah's predictions are becoming further and further divorced from reality. Mr. Lereah is an irresponsible cheerleading. The National Association of Realtor's released its national existing home sales number for July 2006. Nationally, sales of existing homes in July plunged 4.1% from June 2006 to a seasonally adjusted annualized rate of 6.33 million, the lowest since January 2004, the National Association of Realtors said Tuesday. Sales in July are down 11.2% compared to July 2005. The inventory of unsold homes rose 3.2%, compared to June 06, to a record 3.856 million, a 7.3- month supply at the July sales rate, the highest since April 1993. This represents a 39.9% spike in inventory compared to July 2005. The median sales price has risen 0.9% in the past year to $230,000. It matches June for the weakest price growth in 11 years. Prices fell on a year-over-year basis in the West and the Northeast. David Lereah stated "Boom markets are cooling significantly." Cooling is an inappropriate euphemism. The housing market in the formerly boom markets are in an outright decline. The reality of a declining housing market is becoming ever more apparent each week. As the housing market continues to experience significant declines in many bubble markets, we are again returning to the question of who is to blame for the housing bubble. Irresponsible Lenders for lending to people who really can't afford it. All those toxic mortgages. 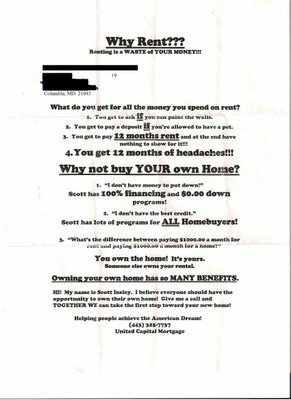 Some HomeBuyers for buying beyond their means and being ill informed. David Lereah, NAR's chief economist, said a market transition is apparent. "With more sellers competing for the pool of buyers, the pressure on home prices has evaporated in most metro areas. After a full year of double-digit gains in the national median price, the timing is right for a cooling in the rate of growth -- we are presently experiencing a soft landing in the housing sector." Many jurisdication have already joined club year over year median sales price declines. Many more will join in the coming six months. Which counties / states / places have thus far reported Year over Year (YoY) declines in median sales price? Please provide information in the above format if possible. If you don't have all the info that ok as well. Thanks. The local housing market will experience a price decline of 5% only under extreme unlikely scenarios. 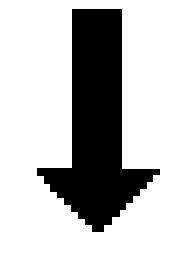 For example, mortgage rates rising to 7.8% in combination with 25,000 job losses could lead to a price decline. The new survey shows that median sales prices for new and resale homes and condominiums in Sacramento County fell 5 percent below July 2005 levels. According to Freddie Mac interest rates on 30yr fixed averaged 6.52 . Jobs are still plentiful in Sacramento as it "showed strong growth in online want ads." [Monster.com] The 'extremely unlikely scenario' where mortgage rates hit 7.8% in conjunction with 25,000 job losses in Sacramento area has not yet happened. Yet, median prices have already declined 5% (YoY) in Sacramento county. The National Association of Realtors' anti bubble reports will quickly become a laughing matter just like the book Dow 36,000. The National Association of Realtors is losing its credibility. Sacramento Land(ing) reports on falling median sales price in Sacramento. July 2006 sales data in the San Francisco area is nicely graphed by Marinite. "The median price paid for a Bay Area home was $627,000 last month. That was down 2.6 percent from June's record $644,000, and up 3.5 percent from $606,000 for July a year ago." Bubble Markets Inventory Tracking continues to track inventory in such places as Orange County, San Diego County, Phoenix Metro area and many others. High Housing starts in Vancouver area. 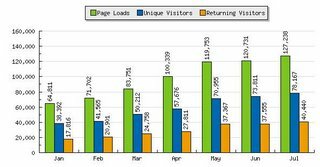 "The July number is the 2nd highest so far this year, and is 32% higher than July 05, and 48% higher than July 04"
DC Bubble Blog has been removed from the blogroll as there has not been a post since July 22nd. Florida Paradise Lost has beed added to my blogroll. Solid blog! 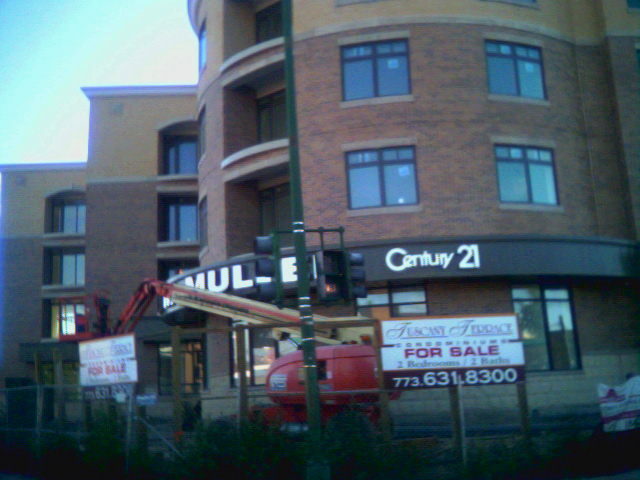 New condo building under construction in Chicago area that will also house a Century 21 Realty Office on the first floor. Since this post was originally posted DROdio Real Estate Inc. has removed all pages that contain the price counter. Lies, deception, and scare tactics are being used by some Realtors to sell houses. 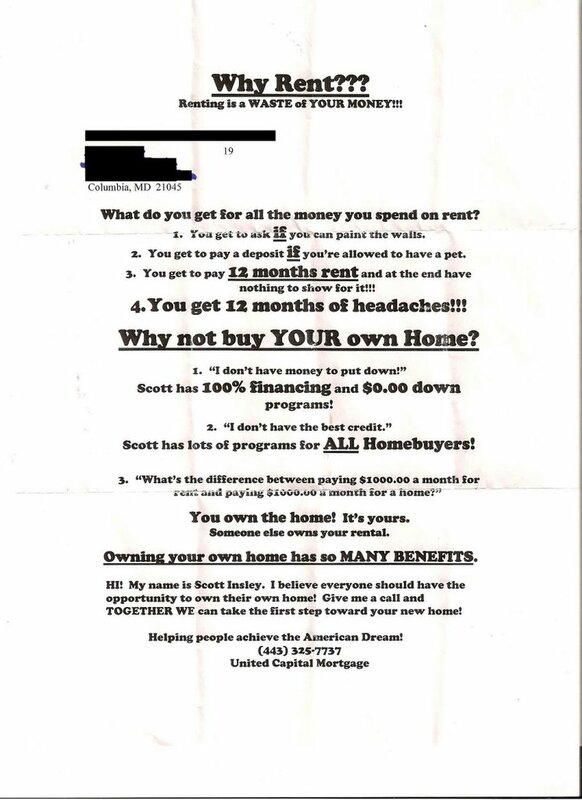 DROdio Real Estate Inc. is guilty of such practices. DROdio Real Estate Inc located in Northern Virginia (Washington, DC suburbs) has a website where there is a counter 'showing' (it has since been removed off of their front page) what the "average home in the Metro DC area currently sells for"
That is the average estimated sale price of a home in the DC Metro / Northern Virginia area! "Average sales prices continued to rise through December  in Northern Virginia, despite a decrease in sales and sizeable increase in inventory. The average sales price [in Northern Virginia] rose to $552,621, a 16% increase over December 2004's average of $476,941." A 16% rise in home prices annually means a 1.3% rise monthly. This translates to a rise of $239.47 increase in value daily, or $9.97 per hour! Become a home owner and have this $9.97/hour work for you, instead of against you! Every hour you wait is costing you $9.97 in equity! Reason 2: Their price counter is based on outdated statistics from December 2005 for Northern Virginia from the Northern Virginia Association of Realtors which takes their numbers from the MRIS. The price counter assumes evenly distributed price appreciation throughout the entire year which is fictitious. 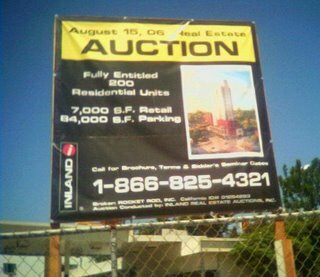 As of 9:25pm on 8/15/06 the price counter showed a average price of $607,705. If we check with the Northern Virginia Association of Realtors (NVAR), they show an "average sales price of $537,731 in July 2005. 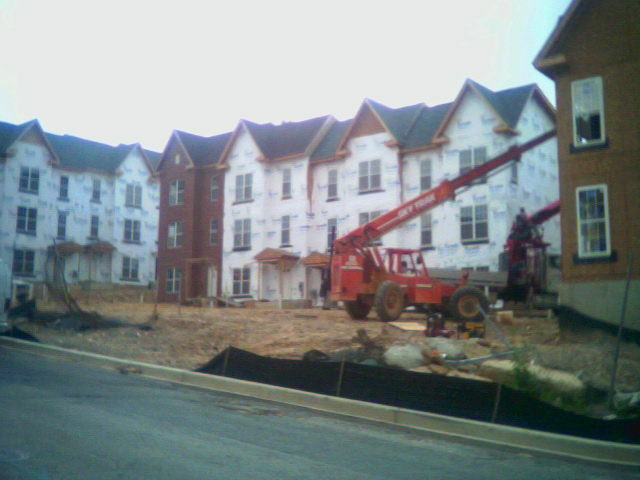 This represents a 3.94 percent decrease from July 2005's average of $559,790." According to the NVAR average sales prices are actually decreasing, not increasing. The price counter is thus going the wrong way. Currently, the counter shows an average price of 607,000 which is 13% above what the average sales price was in July 2006. DROdio Real Estate Inc use lies, deception, and scare tactics to sell housing units. The price counter must be removed. Additionally, DROdio owes an apology for its despicable practices. If you are so inclined to take on the lies, please contact them and tell them to remove their price counter. Call Us: 1-800-705-2782 or email from their contact page or go to their directory page. I agree with you in that the figures are outdated. I've removed them from our site. I'm very sorry to see such a negative posting. You should just realize that we're a very hard working group of people trying our best to fairly represent clients and their interests. Using words like "lies, deception and scare tactics" to describe us is not at all a fair representation, and marginalizes the many, many satisfied customers we have, and the years of work I have put into building our company. I hope you reconsider your position. Owner & Managing Broker, DROdio Real Estate, Inc.
My Response: I am glad you have indeed removed the price counter from your front page. 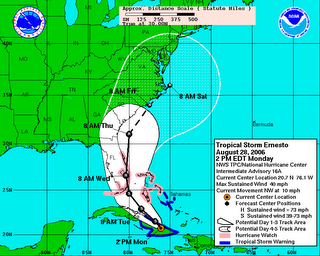 It is still on other webpages as of 12:15am 8/16/06. 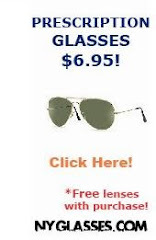 The price counter must be removed from all webpages. You still owe a public apologize for keeping the price counter up for so long. You are obviously very aware of it being there because the company has a very savy website, including a blog. The fact that you were able to repond to my post within 30 minutes of it being posted speaks to the sophistication of your web operation. I demand a full apology and a commitment to represent reality when dealing with clients. 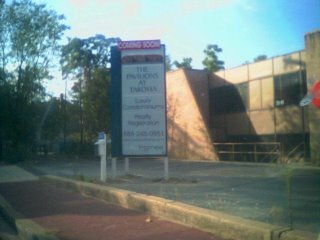 If the price counter is not removed by 5:30pm on 8/17/06 EST, I will be using my contacts at the local media to report DROdio Real Estate Inc. and will also file a complaint with the Better Business Bureau. 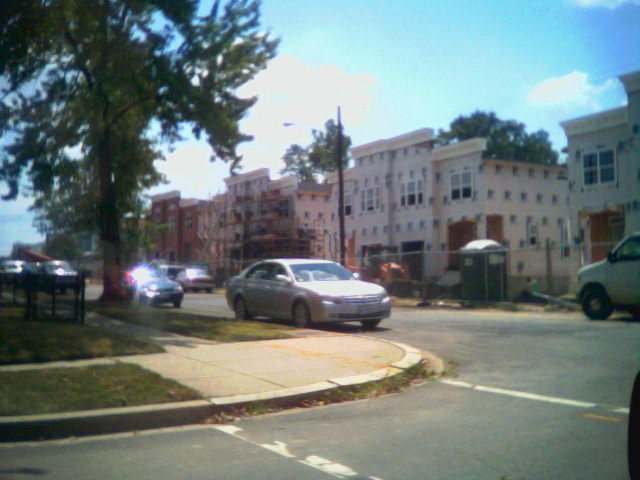 Update 10:20am 8/16/06: DRODio Real Estate Inc has removed all the price counters from their website. They now have "We've removed our house clock while we recalibrate it for the changing market conditions. Look for it in the next few weeks!" Thank you for doing the right thing and removing it. Bubble Meter will continue to monitor your website. The National Association of Realtor (NAR) released their 2nd Quarter 2006 Existing Home Sales numbers. The NAR proclaimed "Metro Home Prices Transition in Second Quarter" while David Lereah announced "After a full year of double-digit gains in the national median price, the timing is right for a cooling in the rate of growth  we are presently experiencing a soft landing in the housing sector." The association's second-quarter metro area single-family home price report, covering changes in 151 metropolitan statistical areas,* shows 37 areas with double-digit annual increases and 26 metros experiencing generally minor price declines - many of the areas with declines are showing weakness in the local labor market. The national median existing single-family home price was $227,500 in the second quarter, up 3.7 percent from a year earlier when the median price was $219,400. In real dollars the 3.7% nominal increase in represents basically flat median prices. Regionally, median sales prices of existing homes increased 3.6% in the Northeast, 4.1% in the South, 3.6% in the West and fell 2.0% in the Midwest. The quarterly report on total state existing-home sales shows that the seasonally adjusted annual rate was 6.69 million units in the second quarter, down 7.0 percent from the record 7.19 million-unit level in the second quarter of 2005. Metro area condominium and cooperative prices, covering changes in 57 markets, show the national median existing condo price was $225,800 in the second quarter, down 0.3 percent from a year earlier. Fifteen metros showed double-digit annual gains in the median condo price, and 14 areas had declines. A full 26 of 57 condo market tracked by NAR, experienced median sales price decreases or increases of less then 3%. In over half of the condo markets tracked by the NAR, the median sales price for condo units is decreasing in real dollars. In general, the condo market is more bubblicious then then the single family housing market. 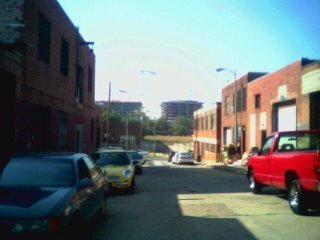 in selected jurisdictions in the Washington, DC metro area. The new monthly numbers for July 2006 are out from the MRIS the multiple listing service for the area. YoY = Year over Year, that is the comparison between July 2006 and July 2005. 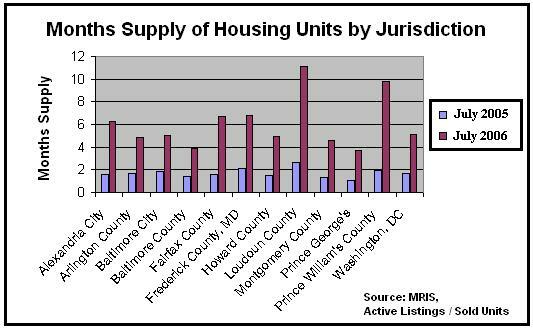 These numbers include all housing units ( not just single family residences but also condos and co-ops). 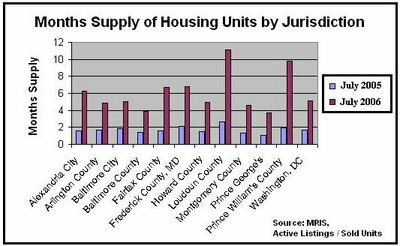 For more numbers on jurisdictions not mentioned here please go to MRIS Market Statistics. The housing market in the Washington, DC is experiencing significant decline. The above numbers are nominal dollars, looking at real dollars (inflation adjusted) the dollar declines are even greater. The real estate agents must be hurting now as the total dollar sales volume for Northern Virginia is down 41.7% compared to July 2005. The market will continue to decline as we head into the fall and winter months. The spring / summer boom, which many in the housing industrial complex had hoped for, failed to materialize. In the Washington, DC area a declining housing market is reality. The USAToday is delivered to tens of thousands of hotel rooms across the country each and every day. This morning I work up and looked at the paper. One of the front page stories was 'For Some Renting Makes More Sense'. "Real estate is probably the best investment any young person can make," says Yadiris Ferreira, 29, who bought a condo last month in Pembroke Pines, Fla. Still, her mortgage, including homeowner association fees, totals $1,800 a month — more than half the money she takes home as a high school math teacher. "It's crazy," Ferreira concedes. But, she explains, "If I didn't buy something soon, it was going to get to the point that I couldn't afford anything." There are still greater fools out there. :-( The scary thing is that she is a high school math teacher. If I were a principal of that school and she told me during the interview that she just bought a condo in a bubble market last month and proclaimed "If I didn't buy something soon, it was going to get to the point that I couldn't afford anything," she would not be hired. Yikes! A huge congratulations to Ben Jones on his interview with MSNBC. Ben's The Housing Bubble Blog is the leading housing bubble blog. Great interview! 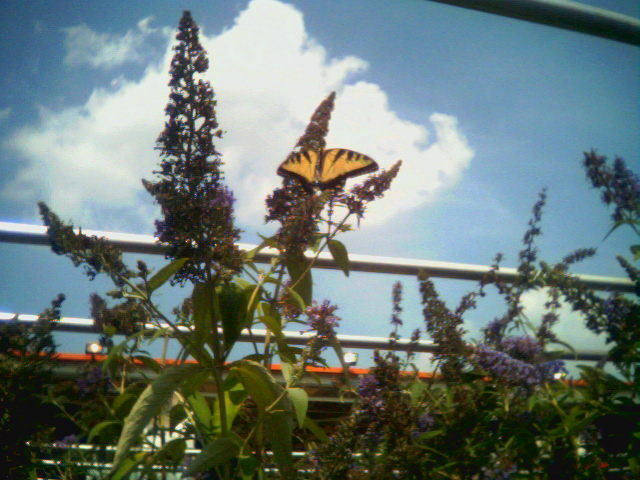 A hearty welcome to Florida Paradise Lost blog. 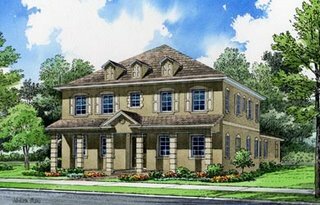 The blogger out of Tampa writes "Will Florida ever become an affordable place to live again? Only time will tell, and you'll be able to read about the journey (to sanity, or maybe not) right here"
Housing Panic declares Dubai, United Arab Emirates to be the epicenter of the world housing bubble. 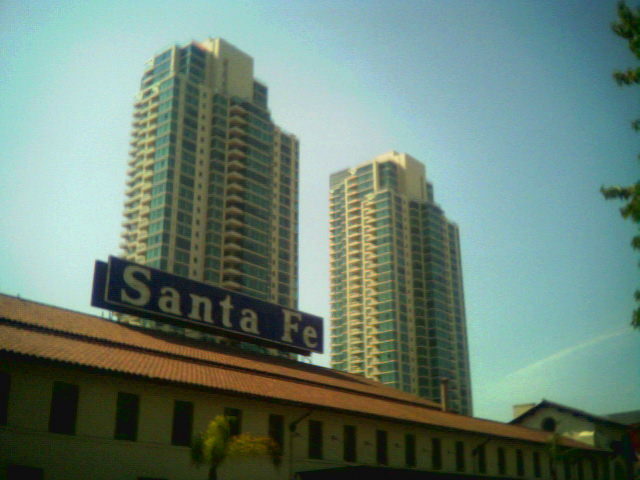 Canterbury Place: "Base Plan Prices From $320s-$738s"
Many condos are being built in downtown San Diego. Many have been built. Last night, many of the condo towers had few lights on, which is an indication of low occupancy. 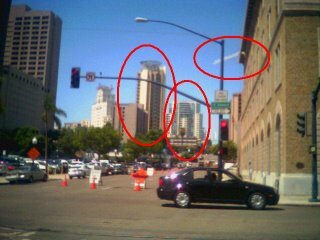 As I entered downtown San Diego, I saw a sign on the side of the road that read DumpingCondos.com. 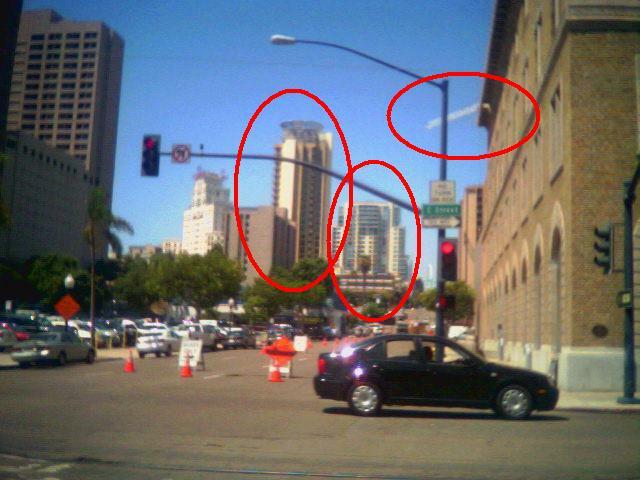 There were a bunch of condo sales office in the GasLamp District. Toxic mortgages for everyone! Anyway, its lovely weather here, which is tempting me to buy this very condo. 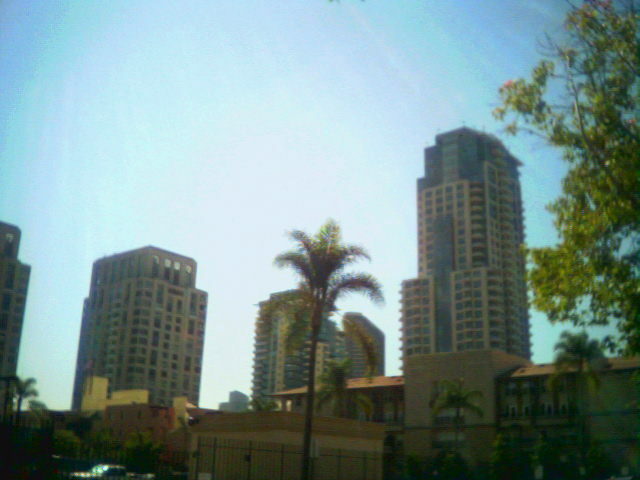 I am sure a few years ago, before the housing bubble, San Diego's weather must have been miserable year round. 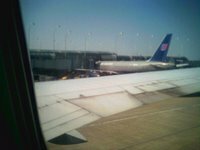 I will be heading to LA soon and will have a report from there. Lets take this as an example, there is a house located in a bubble market that is selling for $450K. Your monthly costs associated with buying are $2700. The flipper is also offering to rent out the house for $1800 a month because there has been no interest for the house. You decide to rent from Mr. Flipper. Mr. Flipper is an inexperienced landlord, but overall it is okay because the house is relatively new and was solidly built. After 12 months, the flipper is desperate as they can't make the mortgage payments due to an adjustable rate mortgage that just adjusted. Prices have fallen in that area about 7.5% in the past year. The flipper decides to sell the house at $416,250 or 7.5% less then what he was asking for a year ago. That would be a price reduction of $33,750. How much did you save by rent and not buying for the year? So we get 33,750 + $10800 (12 * 900 (savings on monthly housing costs - 4800 ( (12 & $400 (monthly principal payments) ) = $39,750 extra to buy for that year. Now divide this number by 52 (the number of weeks in a year) and it like saving $764 a week. The housing market has changed dramatically in the bubble markets since over the last year. 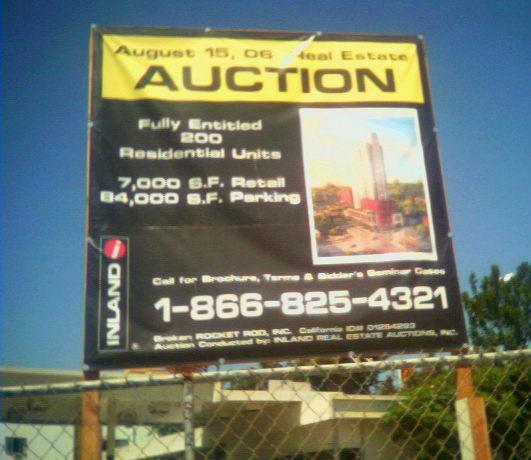 Back in the summer of 2005 bidding wars were common and inventory was very low in the bubble markets across the USA. Those days are long gone. Today, a new reality faces both buyers and sellers. Its the Inventory Stupid! 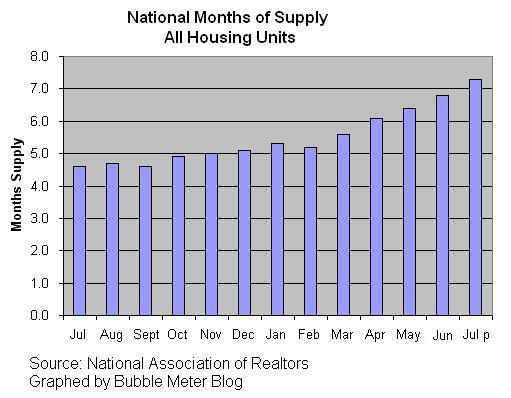 Inventory has increased dramatically in most bubble markets in the past 12 months. In Phoenix, inventory rose from 10,748 on 7/20/05 to 51,557 on 7/20/06 according ZipRealty and Bubble Markets Tracking Inventory. "America is officially into a buyer's market, so (there is) no reason to sit on the sidelines and wait for a price drop," Riggins said. "Just like home builders are offering incentives, more and more sellers are offering incentives such as holding the note, paying down the interest rate or assisting with closing." Real prices will continue to decline in the bubble markets for many more years. The bubble markets will experience price declines of at least 20% in real dollars [inflation adjusted] over the course of 3 years [from the peak]. In many bubble markets, the peak price was reached late summer 2005. Most bubble markets will experience real price declines significantly greater then 20%. Some may experience real dollar price declines of 40% over the course of 3 years. Many markets may experience real dollar declining prices for more then 3 years. Just as importantly, monthly rents are generally cheap compared to buying in the bubble markets. Buying in the bubble markets generally costs 1.25 to 2.5 times the cost of renting ( for a similar property; assuming 30yr fixed, solid credit, property taxes, and typical interest rate tax deduction). Each month hundreds if not thousands of dollars can be saved and invested if one chooses to rent as opposed to owning. Buying now in a bubble market does not make financial sense. As housing inventory continues to rise and prices decline there will be lots of buying opportunities in the future. If you earn a reasonable income it is an absolute fallacy that you need to "Buy now or be priced out forever." In the Bubble Markets, renting and waiting is fiscally prudent. Don't be fooled. Dean Baker is the co-director of the Center for Economic and Policy Research. He is the author of The Conservative Nanny State: How the Wealthy Use the Government to Stay Rich and Get Richer. He just wrote an article called The Coming Housing Crash. Here are some excerpts. This bubble sustained the economy through the 2001 recession and provided the basis for the recovery. The housing sector directly employs more than 6 million people in construction, mortgage issuance and real estate. The indirect effect of the bubble was even larger, as people took advantage of the rapidly growing value of their homes to borrow huge amounts of money. This borrowing binge supported rapid consumption growth in a period of weak wage and job growth. It also pushed the U.S. savings rate into negative territory for the first time since the beginning of the great depression. Right on. The economic 'recovery' coming out of the 2001 recession was built on an mountain of debt. So what happens next? But, it was inevitable that the bubble would eventually collapse. The record run-up in housing prices led to record rates of housing construction. With population growth slowing, the country was building homes far more rapidly than the market could absorb them. At some point, excess supply will put downward pressure on prices. The weakening of the housing market was further assisted by an entirely predictable rise in mortgage interest rates. The Federal Reserve Board deliberately pursued a low interest policy to help the economy recover from the stock crash, pushing interest rates to their lowest level in 50 years. With inflation picking up steam due to the oil price spike, higher import prices, weaker productivity growth, and a stronger labor market, interest rates are rising back to more normal levels. So what effect will the housing bubble have on the genereal economy. So is a recession is coming? Together these effects virtually guarantee a recession, and probably a rather severe recession. Even worse, there is no easy route to recovery from a recession that results from a collapse of a housing bubble, just as there was no easy route to recover from the stock crash induced recession of 2001. Greenspan used the housing bubble to recover from that crash, because he saw no other mechanism. Unless Bernanke can find some other bubble to inflate, the recovery may be a long slow process. It took Japan almost 15 years to recover from the crash of its stock and housing bubbles. There is growing chorus of economists and armchair pundits predicting a coming recession. A significant recession is coming in the next 12 months. The Mortgage Bankers Association reported that mortgage loan application was down to May 2002 levels. The Mortgage Bankers Association (MBA) today released its Weekly Mortgage Applications Survey for the week ending July 28. The Market Composite Index, a measure of mortgage loan application volume, was 527.6, a decrease of 1.2 percent on a seasonally adjusted basis from 533.8 one week earlier. This is the lowest that the index has been since May 2002. On an unadjusted basis, the Index decreased 1.4 percent compared with the previous week but was down 29.0 percent compared with the same week one year earlier. The refinance share of mortgage activity increased to 37.0 percent of total applications from 35.6 percent the previous week. The adjustable-rate mortgage (ARM) share of activity decreased to 27.8 percent of total applications from 28.6 percent the previous week. The ARM share is at its lowest since March 2004. Calculated Risk has a superb post with great graphs. 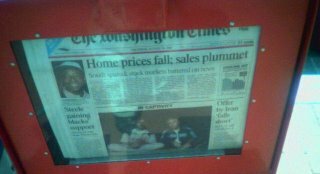 Obviously, this is more evidence of the significant declines occuring in the housing market. DC Housing News is no longer in existence. Out At The Peak has not been updated since July 8th. 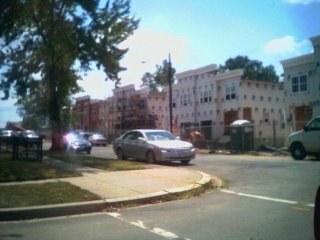 Shortly, both DC Housing News and The Boy in the Big Housing Boy Bubble will be removed from my blogroll. :-( Out At The Peak is on the watchlist. Stay strong! Oh BubbleSphere! We will continue shining light on this speculative episode. Collectively, the bubblesphere is a powerful source of information that is being read by tens of thousands of people each and every day. "I sing of ARMs and the Man..."
We don't really have that much more to sing about ARMs, dear readers, but we just couldn't resist the headline. Still, now that we think about it, our cautionary tale is likely to end just as bloodily as any epic poem we've read. Imagine what would happen if mortgages were adjusted upwards to rates anywhere near 10% - or any where near where they were 25 years ago? That is why the Bernanke Fed cannot really fight inflation or stagflation the way Paul Volcker once did. Too many homeowners wouldn't be able to afford it. ARMS were meant to give marginal borrowers flexibility. Instead, they have locked both the borrowers and the Fed itselfinto...well, leg-irons. The borrowers have no margin. Most cannot affordeven the slightest boost in their payments. And with such boosts now automatic, the Fed can only react to inflation threats by prevaricating. According to David Rosenberg at Merrill, discretionary items are now rising at a 5% annual rate - far beyond Ben Bernanke's target. But what can he do? ARMs were supposed to be a way to realize the American dream of homeownership. But, like much else in American life, that dream too has been hollowed out. The Daily Reckoning is a an excellent read. Currently, they are very bearish. 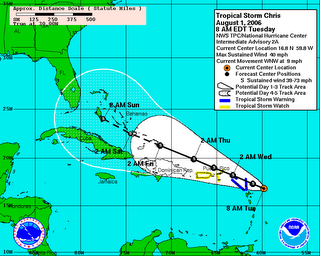 Topical Storm Chris threatens bubblicious southern Florida. Lets hope that this one does not strengthen and become a hurricane.